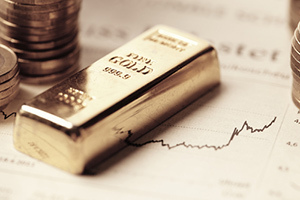 Owning gold is an essential part of any investor's portfolio. Not only is it an insurance policy against another financial crisis – gold prices can also surge, padding investor's profits. And 2019 is shaping up to be a year when owning gold is more essential than ever. We could even be on the verge of a full-on gold bull market. The price of gold fell 1.98% in 2018, but the metal closed the year on a tear, surging 7% between August and the close of the year. That's the bullish trajectory we've been waiting for, and it means gold prices in 2019 are heading even higher. Gold ended the year at $1,283 an ounce, and today gold trades for $1,312 an ounce. But this is just the beginning of a gold bull market. And a bull market rally in gold could make gold investors rich. Since 1970, every gold bull market has delivered exceptional returns to investors. The median return in these markets over the last four and a half decades is 451.4%, and the median duration of the bull run is 41 months. That means you still have a chance to get in early on what's shaping up to be one of the best years for gold prices yet. In fact, we'll show you four catalysts that will propel 2019 gold prices even higher. Plus, we'll reveal Money Morning Resource Specialist Peter Krauth's 2019 gold price prediction that you don't want to miss…. The stock market is in the middle of a historically long bull market. But with the record-long bull market nearing its 10-year anniversary, the probability it will end only grows. Not only have we seen examples of pessimism creeping into the stock market – like the Dow's 9% plunge in 2018 – but stocks are sitting at historically high valuations. The Case Shiller P/E ratio currently sits at 30.02, nearly double its historic median value of 15.70. Even more chilling, the ratio has only risen higher during the bull markets preceding the 1929 stock market crash and the 2000 tech bubble. Plus, uncertainty continues to rise. The government shutdown between December and January was the longest ever at 35 days. The debt ceiling is reinstated on March 1. Brexit officially begins in March. And the potential for the U.S.-China trade war to escalate is as high as ever. Any of these events could be enough to send the stock market spiraling down. But that's a major catalyst for gold prices – and why it's so important for investors to have gold in their portfolio. According to Goldman Sachs Group's Jeffrey Currie, "If U.S. growth slows down next year, as expected, gold would benefit from higher demand." Ray Dalio, founder of Bridgewater Associates, is also recommending investors add to their gold positions as the end of the business cycle nears. "If you don't own gold… there is no sensible reason other than you don't know history or you don't know the economics of it," said Dalio. After the 2008 financial crisis, the Fed slashed interest rates to their lowest level ever, 0.25%. After nearly a decade of keeping rates historically low, the Fed is committed to hiking rates again, and this is going to boost gold prices in 2018 and beyond. Now, the "conventional wisdom" holds that rate hikes hurt gold prices. But this isn't true or accurate. Gold prices tend to fall just ahead of a potential rate hike from the Fed, but prices surge after a rate hike. This is a demonstrable trend going back 30 years. And that doesn't even factor in the 1970s and '80s, when the Fed hiked rates to astronomical levels – reaching 20% in 1980 – while gold followed to hit a then-record high of $594. After hiking rates four times in 2018, we're expecting to see a similar rally for gold kick off in 2019. And while the Fed may slow down, if not end its rate hikes altogether in 2019, that would be good for gold too. Even though the "conventional wisdom" on rate hikes is wrong, it still puts short-term pressure on gold prices during the run-up to a rate hike. One of the best indicators of where gold prices are heading is mining activity. You see, when gold miners expect prices to rise, they start to mine more gold. After all, who is more plugged into the price of gold than the businesses who rely on making accurate predictions about it? S&P Global Market Intelligence (SPGMI) predicts spending for mining exploration will surge 20% in 2019, jumping from $4.05 billion to $4.86 billion. And SPGMI reports gold exploration made up 55% of total exploration in Canada, Australia, and the United States last year. Plus, mergers and acquisitions activity is heating up in the gold mining space. Between January and July last year, M&A activity reached $71.4 billion. But in the three months between August and October, total activity surged to $85.7 billion. Between rising exploration and M&A action, gold miners are gearing up for a big year – a great sign that prices are heading higher. As one of the world's oldest currencies, gold is turned to in times of instability as a reliably strong asset to hedge against the ups and downs of stocks or bonds. That's no more true than when global tensions raise uncertainty and put traders on edge. Consider Britain's vote to leave the European Union on June 23, 2016. In just under two weeks after the Brexit vote, gold prices surged 9% higher. Now, the United Kingdom is scheduled to formally withdraw from the EU on March 29, and with no agreement in place, uncertainty could send gold surging again. Venezuela, which has the world's largest oil supply, is on the verge of collapse. The United States now recognizes Venezuela's opposition leader as the leader of the country as Nicolas Maduro tries to cling to power. In fact, with Venezuela's currency destroyed by hyperinflation, gold has become more important for the country than ever. The United States just left the INF treaty with Russia over complaints that Russia was not following the rules, but that could kick off a global arms race for intermediate-distance nuclear weapons. The treaty banned them for fear that they move so quickly a country could be tempted to make a nuclear "first strike" before the other side had a chance to retaliate. And the trade war with China is far from over. If a new trade deal isn't reached, tariffs on Chinese goods will more than double overnight. American and Chinese trade officials have signaled that an agreement is far from close. 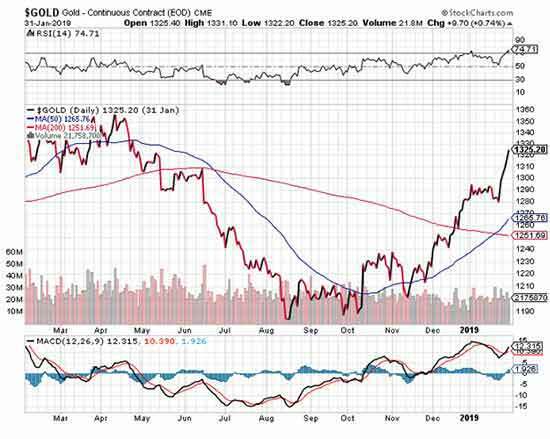 Those are only a few possibilities of the destabilizing events potentially in store for 2019, and all of them will send gold prices surging. Money Morning Resource Specialist Peter Krauth forecasts that gold prices could reach $1,400 an ounce by the end of the year. That's a 7% gain from today's price. And while that might seem like a modest increase, gold's also going to act as an insurance policy against financial uncertainty. That's also on top of what Peter calls "peak gold." Production has mostly plateaued, while both China and India – the world's largest gold consumers – continue to buy the metal as central banks across the world add gold to their portfolios. That's creating the sort of demand that could drive gold prices even higher. And as you can see, the momentum is on gold's side. The chart below shows just how quickly gold prices have soared since its recovery began in October. But what's even more important to note is the way it has climbed up. You can see a pattern forming a "golden staircase," where gold prices rise, level off, and then rise again. We expect that pattern to continue this year, up to gold prices reaching $1,400 an ounce. And they could go even higher if a geopolitical event destabilizes the economy.